Fermented foods help to support digestion and immunity in our gut. Not only is our digestive tract the largest part of immune system, it also has neurotransmitters that control our mood and energy level. Fermented foods are natural probiotics, which can be helpful with everything from allergies to dermatitis to irritable bowel syndrome. The yeast in fermented foods help to breakdown the food, enabling our body to better absorb important nutrients. It also removes unhealthy toxins and kills harmful bacteria. Beware of commercial fermented products, which often lack the live culture needed for the health benefits due to use of pasteurization and other quality control procedures. Below are some examples of healthy fermented foods. Home-made pickles. You can pickle anything from cucumbers to beets (more on that in future blog entries). Kimchi, which is a traditional pickled spicy cabbage, common in Korean foods. Kombucha tea, a fermented, sweetened black tea traditionally from China. Sauerkraut, a fermented sliced cabbage dish, originally from Germany. How do you enjoy your fermented foods? We would love to hear from you! In my miso entry, I mentioned some health benefits of fermented foods. While there are many commonly eaten fermented foods (more on that in my later entries), the easiest way to add fermented foods into your diet is in the form of a beverage. Pu-Erh tea is a great fermented drink option. Pu-Erh is one of my favorite Asian teas. Produced in the Yunnan province in southwest China, it has a strong flavor, dark color and contains less caffeine than most teas. The tea leaves are picked early, drie d, then fermented for 10-20 years. 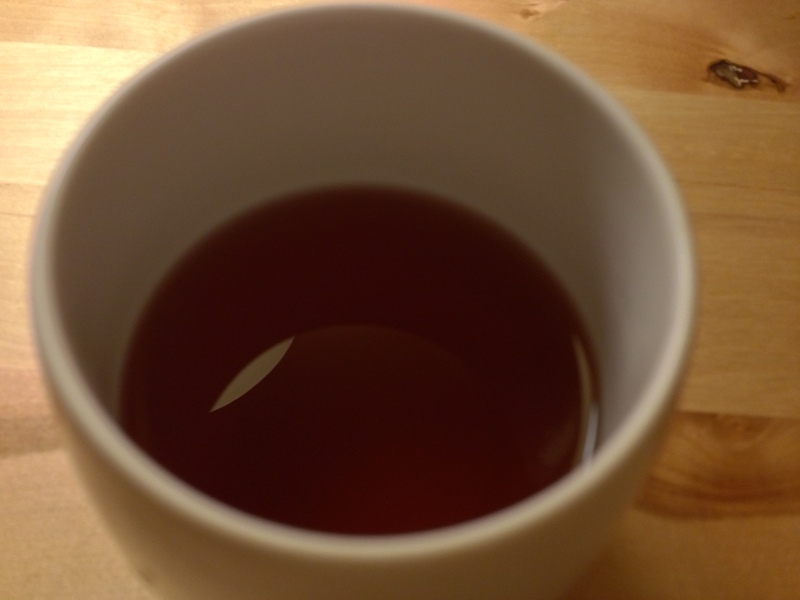 As with wine, the tea’s value and flavor increases with a longer aging period. Pu-Erh teas are prized in China for their health benefits. In addition to improving digestion, studies have shown that drinking Pu-Erh daily lowers cholesterol in patients with hyperlipidemia. Make sure the temperature of the boiling water is around 212 degree Fahrenheit. Wet and rinse the tea leaves with boiling water before the first brew. Pu-Erh requires very short brewing time; steep each cup for only about 15-20 seconds, then remove the tea strainer. You can usually re-brew the same tea leaves up to 10 times. If you are thinking about adopting a plant for your home or garden, consider the Aloe Vera plant. The Aloe Vera plant in our house that have been around for over a decade. It is beautiful, and easy to maintain. Not only does it provide greenery in our apartment, it is a great source of nutrients as well. Even my cat Lucy loves it! Whenever I am not paying attention, she often jumps up to the windowsill to get a bite of the aloe plant. Once she gets a chunk off, she start chewing it like a piece of bone. Aloe filling is juicy and meaty, so no wonder she loves it so much. Aloe vera plants look a lot like cactus, since they have a tough shell with spiky leaves and tend to grow outward rather than upward. 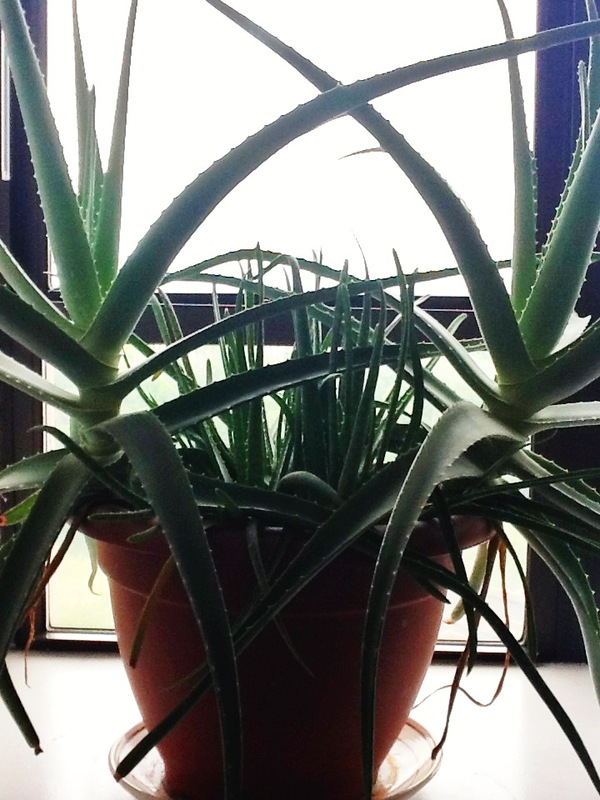 Like cacti, aloe vera plants are also a succulent, so it only requires watering once a week (yay!). We all know aloe is great for your skin as it’s often used to treat sunburn, rash, and acne. But aloe is so much more than that. Often called a miracle plant, aloe vera is anti-inflammatory, anti-cancerous and immune-boosting. Aloe is often used as a digestive aid to treat various GI conditions. Nutritionally, Aloe contains vitamin B (including Vitamin B6 and B12), vitamin C, vitamin E, beta-carotenes and niacin. It is also rich in minerals including potassium, magnesium, copper, iron, calcium, zinc and manganese. It even has more than 15 different types of amino acids. One of the easiest ways to consume aloe is in by putting it into a smoothie. Although you can eat the aloe meat raw, it can be a bit bitter and leaves a slight aftertaste. To prepare aloe, cut a roughly 6-inch segment from the plant. Using a knife, cut the jagged edge off from the 2 sides first, then take the skin off using the knife leaving only the white, clear fillet exposed. Below is a simple green aloe juice recipe to try at home. Add all the ingredients into your blender, start with the liquid, then rest. Blend on high for 30 seconds or until creamy. Do you have a favorite aloe recipe? Please share! The bad news is that your metabolism slows with age. The good news is that you don’t have to give up hope. There are plenty of things you can do to prevent the slowing of the metabolic process. It is important to avoid constant, long-term stress and not to skip meals. Stress and skipped meals slow down your metabolism and causes your body to go into “energy conservation” mode, thus slowing down the calorie burning process. It’s no news that exercise is the fastest and most effective way of increasing your metabolism since lean muscles consume more calories and increases your basal metabolic rate. Did you know that certain foods can also boost your metabolism? Even small things such as drinking water will help to maintain a healthy metabolic rate. The foods below not only have a lot of healthy benefits, but they will help your body burn more calories and boost your metabolism. 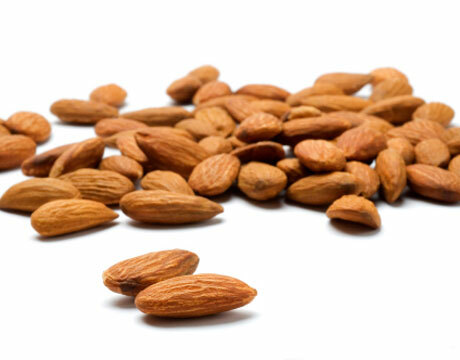 Packed full of nutrients and antioxidants, almonds are high in protein, omega-3 fatty acids, and fiber. This makes them filling and requires the body to burn more calories to digest them, thus increasing your metabolism. In addition to being a great source of calcium, magnesium and antioxidants, studies have shown that a cup of almonds each day can helps to increase your body’s metabolic rate. Be sure to choose unsalted/unsweetened almonds to avoid preservatives and unnecessary calories. Grapefruit and grapefruit juice can help regulate insulin levels in body, which is important for controlling body weight. Weight loss studies have shown that consuming grapefruit or its juice daily (preferably immediately before each meal) can lead to more weight loss. Avoid grapefruit juice from concentrate, which contains a lot of sugar and often contains artificial sweeteners and additives. Adding this red hot chili pepper spice into your dish will not only give your tongue a kick, but it will jump start your metabolism too. Simply season dishes with cayenne pepper powder to enjoy the health benefits of capsaicin, which is known for its anti-inflammatory properties, as well as its metabolism-boosting benefits. Stopping dairy and sugar: Dairy and sugar are 2 of the only foods that are correlated with increase in acne. In a 2010 review of the literature on diet and acne published in the Journal of the American Academy of Dermatology (JAAD), milk and sugar were the only 2 foods that had any scientifically proven link to diet. This was more true for sugar than for milk. Personally, milk seems to be a bigger player for me, and low-fat dairy was worse for preventing acne than full-fat dairy. While all dairy seems to aggravate my skin, I found that ingesting small amounts of grass-fed cheese from the farmers market daily has not caused any harm. One possible theory why dairy causes acne may be that hormones in cows milk cause an increased secretion of sweat in the hair follicles, which serve as a nesting ground for acne causing bacteria. While scientific evidence for link between dairy and acne is not overwhelming, a trial without dairy and sugar, in my opinion, never hurt. Considering all the complements about ” glowing skin” I have been getting even after 2 weeks of night float or 4 weeks of 15 hour or more days on inpatient, going off dairy has been worth it for me! Scientific evidence for the link between sugar and acne is actually stronger. Here, sugar includes all highly refined foods, processed foods, and other foods with high glycemic index. Some very interesting and well done studies showing decreased acne in people who ate less sugar, and no acne exist in hunter-gatherer societies that ate a low-glycemic diet. The idea is that increased insulin from a high sugar diet leads to high levels of insulin like growth actor, or IGF-1, which seems to correlate with the amount of acne. In my opinion, this reinforces my own experience with dairy as well. IGF-1 sequesters less in the fatty portion of the milk. Cows raised naturally on a farm presumably have lower levels of IGF-1 so it makes you wonder about whether that is the cause for my sensitivity to factory raised cows milk. It also raises interesting questions about meat and high protein diets, which we know cause high levels of IGF-1 in the blood. Rotating cleansers : I alternate between conventional cleansers that can be drying with more natural cleansers that are more gentle but don’t always get out the worst of the muck. 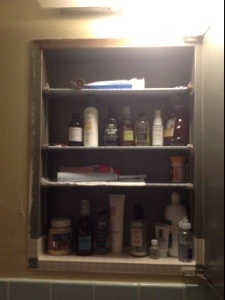 I use the conventional cleansers when i feel really greasy followed by a spray of natural toner to prevent drying. I still haven’t found a good, non-greasy moisturizer for my face. I welcome any suggestions for natural moisturizers! Cutting out sour and fermented foods – In Ayurveda, ingestion of sour and pungent taste is associated with increased inflammation of the skin. Fermented foods are considered by default sour. This means cutting down on vinegars, alcohol, as well as yogurts. Tamarind, a common ingredient in Indian dishes, is also a no-no. Lemon is surprisingly fine because it has sweetness that balances the sour. Applying honey on the face – In Ayurveda, honey is considered drying and pungent. It also has intrinsic anti-microbial properties. Honey is a super-saturated solution, meaning that it draws in moisture, even the moisture inside bacteria, causing them to shrivel-up and DIE. It also draws moisture from your skin, making pores smaller. I do a face mask with mixture of honey and lemon. Simply apply the mask at night for five minutes and then washed off. It does absolute WONDERS and I always get glowing skin compliments the next day. This I have to thank my Ayurveda guru Vasudha Gupta. Keeping clean: Changing the pillow covers regularly and avoid touching my face have been pretty key. Why does this work? Well, there is no evidence behind this, but common sense acne is caused by infection by the p. acnes bacterium of a hair follicle that is plugged up with dead skin-cells, dirt and sweat. So touching my face with unwashed hands probably contribute to plugged hair follicles. In Ayurveda, washing hair frequently and not letting your hair touch your face is one way to prevent acne. My pillow case is not always in contact with clean hair, not to mention the fact that my dirty hands are all over them too. Keeping pillow cases clean and avoid too much contact with my face seems to keep the acne away. Staying hydrated with room temperature water: This is another piece of advice from ayurveda. In ayurveda, sipping room-temp water throughout the day is considered cooling and reduces inflammation. In addition, sipping water washes toxins away. Interesting fact: teenagers with acne prone skin have more inflammation of the skin even where there is no acne. It seems there is less linoleic acid in acne prone areas of the face, according to one of the textbooks on dermatology I referenced. Linoleic acid is the plant form of omega 3, and is found in higher amounts in many seeds such as flax, chia, walnuts, almonds ans sesame. I would like to try an experiment in which I basically put flax oil on my face (perhaps as a light moisturizer after washing my face or maybe use a little to dissolve the sebum before washing my face? Has anyone tried this or heard of anything similar?). What is your secret to a healthy skin? Please share! Jersey but decided on principle to get Japanese instead. We regretted the decision later. pleaser, it appeals even to the most meat-and-potatoes palate. The best part of vegetarian chili? It’s a wonderful way to get people to eat vegetables! It’s also a pretty versatile recipe. recommend adding it to the recipe. I also added optional Indian spices to be used. 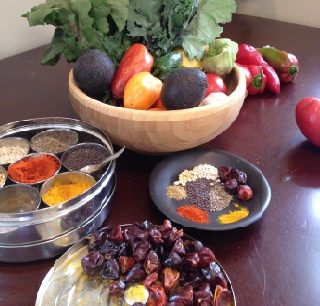 Although not essential, I can never resist adding these spices into all kinds of dishes. I find that they make it easier to digest the beans. In this particular chili, I used fresh heirloom tomatoes from the farmers market. I just love all the gorgeous colors, shapes and sizes! I also used red Russian kale, pictured below. 1-4 jalapenos depending on how hot you like it. I don’t de-seed them, but you can. 4 cans black beans, 2 cans chickpeas or other type of beans, 2 cans white beans or any other type of beans or rough equivalent amount of beans that have been soaked overnight. Leafy green veggies 2 bunches (usually I use Kale and Chard). -Add optional tempering spices at this point. Wait till black mustard seeds start to pop before next step. -Once tomato is thoroughly cooked, add all the canned beans, another tsp chilli powder and the cumin powder and cook for a bit, stirring occasionally. You can cook the beans however long you want. I usually clean most of the kitchen at this point. -In a separate pan, heat oil and sautee squash with 1 tsp whole cumin. Once it is done, add it into the cooking beans. -add greens and push them to the bottom of the chilli so they wilt. including those involved in DNA synthesis and repair), folate (which prevents birth defects during pregnancy, and is much more effective in food form than in folic acid-pill form) and potassium. food, meaning they don’t give you a sugar high. That makes you less hungry and less apt to gain weight! 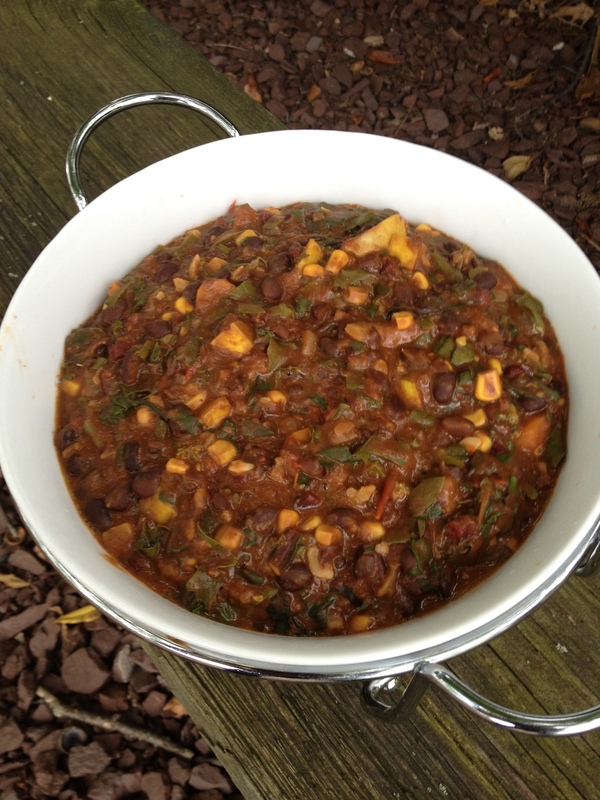 I hope this recipe makes you want to eat your beans!